(1)P The method of analysis shall be selected so as to provide an accurate prediction of the elastic stress response of the structure to the specified fatigue loading. 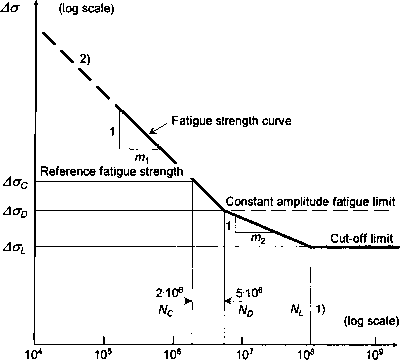 NOTE: An elastic model used for static assessment (ultimate or serviceability limit state) in accordance with Part 1.1 of this Prestandard may not necessarily be adequate for fatigue assessment. (2)P Dynamic effects shall be included in the calculation of the stress history, except where an equivalent loading is being applied which already allows for such effects. (3)P Where the elastic response is significantly affected by degree of damping this shall be determined by test (see Annex C). (4)P No plastic redistribution of forces between members shall be assumed in statically indeterminate structures. (5)P The stiffening effect of any other materials which are permanently fixed to the aluminium alloy structure shall be taken into account in the elastic analysis. (6)P Elastic finite element analysis models shall be used for the global analysis of statically indeterminate structures and latticed frames with rigid or semi rigid joints, except where strain data have been obtained from prototype structures or accurately scaled physical models. NOTE: The term 'elastic finite element analysis' is used to note all analytical techniques where structural members and joints are represented by arrangements of bar, beam, membrane shell, solid or other element forms. The purpose of the analysis is to find the state of stress where displacement compatibility and static (or dynamic) equilibrium are maintained. (1)P Beam elements shall be applicable to the global analysis of beam, framed or latticed structures subject to the limitations in (2) to (8) below. (2)P Beam elements shall not be used for the fatigue analysis of stiffened plate structures of flat or shell construction or for cast or forged members unless of simple prismatic form. (3)P The axial, bending, shear and torsional section stiffness properties of the beam elements shall be calculated in accordance with linear elastic theory assuming plane sections remain plane. However warping of the cross-section due to torsion shall be considered. (4) Welded, bolted or adhesively bonded attachments of length greater than half the member depth should be considered when calculating the section stiffness properties (e.g. cover plates and longitudinal stiffeners). (5)P Where beam elements are used in structures with open section members or hollow section members prone to warping, which are subjected to torsional forces, the elements shall have 7 degrees of freedom including warping. Alternatively, shell elements shall be used to model the cross-section. (6)P The section properties for the beam elements adjacent to member intersections shall take into account the increased stiffness due to the size of the joint region and the presence of additional components (e.g. gussets, splice plates, etc.). (7)P The stiffness properties of beam elements used to model joint regions at angled intersections between open or hollow members where their cross-sections are not carried fully through the joint (e.g. unstiffened tubulars nodes), or where the detail is semi-rigid (e.g. bolted end plate or angle cleat connections), shall be assessed either using shell elements or by connecting the elements via springs. The springs shall possess sufficient stiffness for each degree of freedom and their stiffness shall be determined either by tests or by shell element models of the joint. (8)P Where beam elements are used to model a structure with eccentricities between member axes at joints or where loads and restraints are applied to members other than at their axes, rigid link elements shall be used at these positions to maintain the correct static equilibrium. Similar springs as in 4.1.2. (7) shall be used when necessary. (1)P Membrane elements shall only be applicable to those parts of a structure where out-of-plane bending stresses are known to be negligible. (2)P Shell elements shall be applicable to all structural types except where cast, forged or machined members of complex shape involving 3-dimensional stress fields are used, in which case solid elements shall be used. (3)P Where membrane or shell elements are used within the global analysis to take account of gross stress concentrating effects such as those listed in 4.2.2, the mesh size shall be small enough in the part of the member containing the initiation site to assess the effect fully (see Annex A).